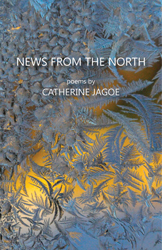 News from the North is a cycle of poems that explore the emotional and physical seasons of life in a northern climate: freeze and release. It was published by Finishing Line Press in February 2015. Order here to order your copy of News from the North from Finishing Line Press. "In this tender and ferocious collection, English immigrant Catherine Jagoe explores her adopted home in the Upper Midwest – and the other Norths it summons – with a gaze both “exquisite and pitiless,” writing about the physical and natural world with such dazzling detail and emotional resonance that we see it forever differently. In language as exacting as Bishop’s and imagery as rich as Roethke’s, these beautiful poems limn a life that, while sometimes difficult, is also drunk with possibilities, glowing, lit by the wonder of every little sun." "In these intense, musical poems of life lived in the cold of Wisconsin, the heat of cycling through the countryside, poet Catherine Jagoe gives us fire and ice, the great immigrant crossings of ocean and continent, seasons and decades, the journey from one heart to another, a door long shut/ inching open to find the news of our unremarkable existences/ with their secret, iridescent insides." "As I read News from the North, like Jagoe, I never expected happiness, but found it in her moving words. These poems give us North, both the ever-changing physical landscape and the metaphorical North of our innerscapes as well. There is here a deep sense of discovery."